Christopher was referred to Caminar’s Assisted Outpatient Treatment (AOT) program after psychiatric hospitalization following an altercation with his family. He didn’t believe he had a mental illness and wasn’t able to define why he had been hospitalized. Christopher is a young man struggling to come to terms with mental illness and delusional thoughts, thoughts that sometimes convinced him the world was against him. He feels isolated, socially awkward, and ashamed for the dark thoughts in his head. Our AOT program assists San Mateo County residents with severe mental illness as they transition from inpatient care to outpatient living. The program provides 24/7 intensive mental health services, housing support, and life skill development for Christopher and others like him. 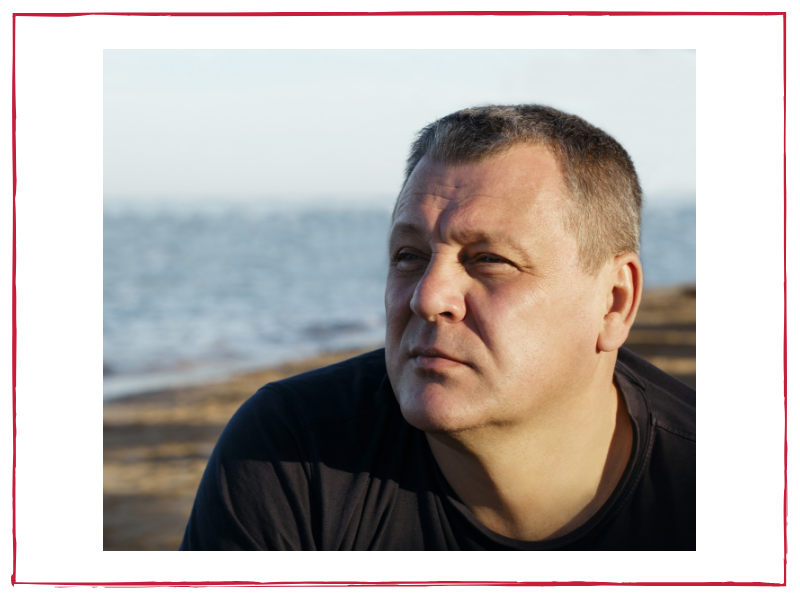 His caseworker helped Christopher to stabilize and avoid another hospitalization. Together they created a safety plan, and the caseworker offered support both to Christopher and his family. Most importantly, the caseworker built trust with him and encouraged him to reach out whenever he needs help in order to prevent a crisis in the future. Christopher is still connected with Caminar. He recently graduated from AOT and stepped down to our New Ventures case management program, which provides lower intensity mental health case management services. Christopher continues to move toward wellness and recovery. And, the AOT program is proving its intended value to help those who struggle to live safely in the community. Recent San Mateo County data, as highlighted in a story in the Climate Online, indicate the AOT program is working. Length of hospital stays also reduced significantly, from 252 days prior to the program to 96 after. Episodes of psychiatric emergency services dropped from 35 to 21. Such reductions in jail time, emergency response, and hospital services have saved the county considerable money. And, the services and care provided allow Christopher and other vulnerable neighbors to move toward wellness and live in the community with dignity. Caminar launched the AOT program in August 2016. The program uses the Full Service Partnership’s “whatever it takes” approach to support individuals with serious mental health conditions to move toward wellness, recovery, and independence. Earlier this year, Tina* entered treatment at Caminar immediately upon discharge from the hospital. 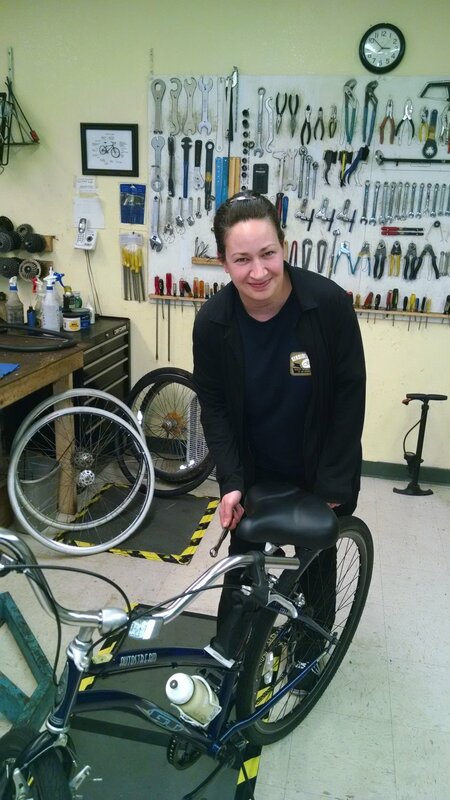 She had been referred to our San Mateo County Region’s Assisted Outpatient Treatment (AOT) program, which provides intensive treatment and support for adults with severe mental illness who are disconnected from the mental health system. Tina had been living with roommates who were actively engaged in unhealthy lifestyles, and she had been heavily abusing substances. Her mental and physical health were in a fragile state. At Caminar, Tina began working regularly and diligently with a psychiatrist and a case manager. And, she enrolled in an outpatient substance use treatment program. With the newfound support and compassionate care, Tina regained her resilience and began to rebuild her life. She invested the time and work to become clean and sober, and her mental and physical health improved. Now, she is living with family, maintaining a healthy lifestyle, working towards securing employment, and committed to the journey of recovery. We are delighted to share with you a story of resilience and hope, which was featured at this year's Circle of Support Luncheon. 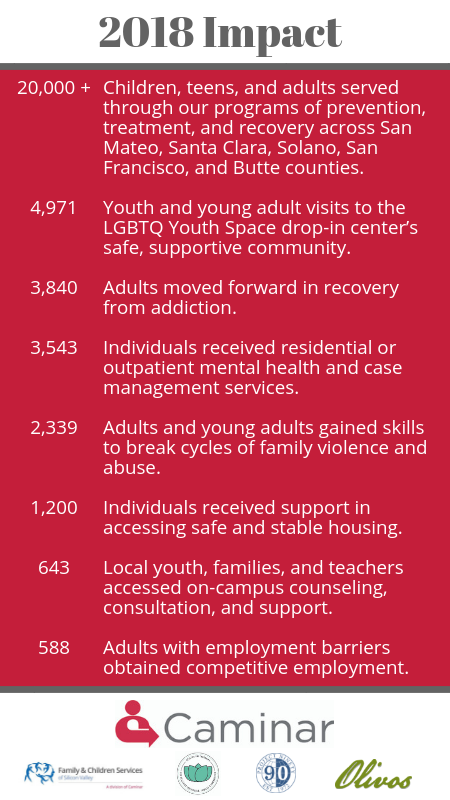 With the help of our Family & Children Services of Silicon Valley Division's Teen FAST Program, one family built circles of support and strengthened their family. The Teen FAST program engages and empowers at-risk youth to make positive life choices. And, it works with the entire family to build and enhance the family. The Luna family's journey with Teen FAST is no exception. Please enjoy this video of how the Luna family learned to communicate and work together to find hope and stability. As we start 2018, we look back on the Caminar's impact in the last year. The work our donors and funders make possible changes lives; the generosity provides people with complex health needs the opportunity to move from crisis to independence. At Caminar and our Family & Children Services of Silicon Valley division, we offer care tailored to the needs of each individual, allowing us to effectively address complex needs and empower people to transform their lives. Because of community support and the tireless work of our staff, people like Thomas and April have a safety net and many lives were changed. 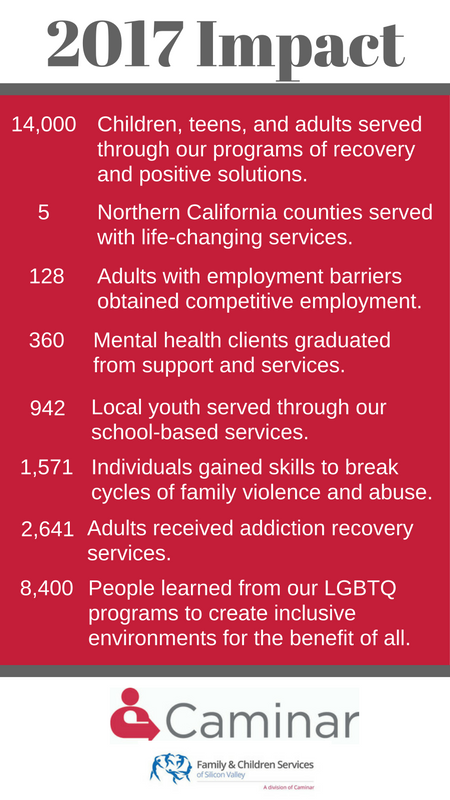 Following our January 2017 merger with Family & Children Services of Silicon Valley, we have expanded our reach and strengthened our capacity agency-wide to help our most vulnerable community members toward an improved quality of life. We look forward to continuing this work in 2018! The onset of mental illness interrupted this veteran's pursuit of his life goals. With coaching from Jobs Plus and his own dedication, today he has hope again for his future. At our 2nd Annual Mental Health Symposium back in May of this year, we premiered a very powerful video of one of our former clients. The subject of the film, Sheri, faced serious depression, which led her to engage in self-destructive behavior and attempt to take her own life. Thankfully she survived and was referred to Caminar, where she received services that have helped her in the long road to recovery. Please take a few minutes of your time to watch this very inspirational story. If you missed hearing Thomas' story at our 51st Anniversary Celebration earlier in November, you are still in luck...you can watch his story here and learn how Caminar's Supported Housing programs enabled him to overcome homelessness and depression and how he is now living a healthy life in a home of his own. Thomas proves, recovery does happen!